Ultrarunner Dave Stevens is currently 68 miles into his attempt on the Pennine Way record. The former Parachute Regiment member has another 200 miles to go, but is ahead of his schedule as he prepares to enter the Yorkshire Dales national park. Stevens set off from Edale in the Peak District at 4am on Friday, aiming to beat Mike Hartley’s fastest time for the 431km (268-mile) route. His target is to complete the Pennine Way in 58 hours to take the title of fastest runner from Hartley, who set his time of 65hrs 20mins 15secs in July 1989. At the time of writing, Stevens was approaching the southern boundary of the Yorkshire Dales just outside Gargrave. grough caught up with the runner on the Brontë moors in West Yorkshire mid-afternoon where he was being accompanied by local runner Gary Chapman after completing part of the route solo. He was in good spirits and looked comfortable, setting a pace slightly ahead of his anticipated timings, though he said he wasn’t going to go push things too hard. “After all, it’s 10 marathons,” he said. Conditions were good, with a cool south-westerly breeze and the terrain reasonably dry. The weather has been benign, though the runner faces some rain overnight, clearing by dawn. 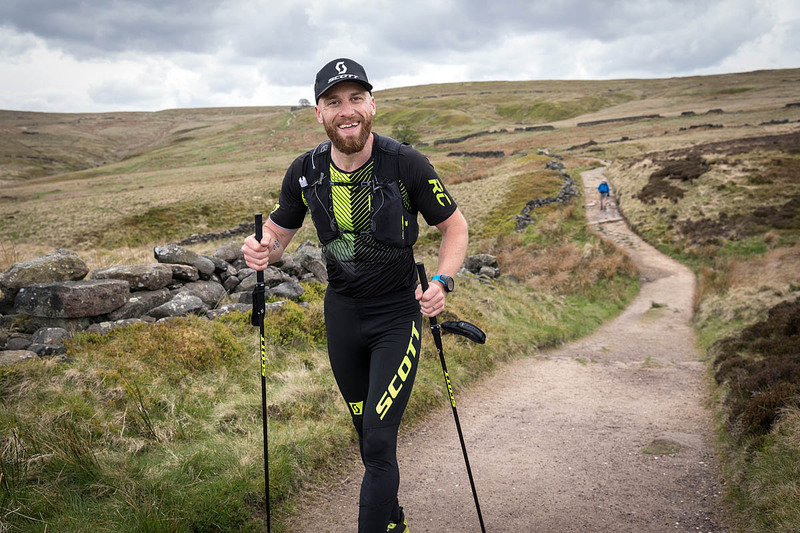 Czech runner Pavel Paloncý abandoned his attempt on the Pennine Way record in 2017 when he fell behind the schedule needed to beat Hartley’s time. The three-times Montane Spine Race winner pulled out of his challenge at the Hadrian’s Wall section of the Pennine Way. Dave Stevens’s progress can be followed online via the Open Tracking website.